The team has been involved in developing and implementing the remediation management plan, the supply of raw material and the execution of the remediation at large mines. 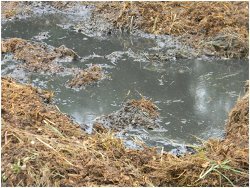 The type of sludge treated and remediated included organic polluted sediment/sludge containing rolling oil, animal fat and semi-volatile organic parameters. The end use determines the success, rate of remediation and clean up targets. The most successful remediation activity completed was at a large mine where 160,000 tons of oil and semi-volatile polluted sediment where in-situ remediated as a green area end use. The polluted area of 70,000 square meters has been successfully sloped and vegetated. Various bioremediation trials have also successfully been used on oily and off-gas sludge.